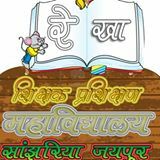 Rekha Shikshak Prashikshan mahavidyalaya B.Ed College (B.Ed. College) is run by Rekha Public school Shiksha Samiti Sanjharia, Sanjharia a society registered under Rajasthan Societies Registration, Act. 1958 with the registrar of the Societis Government of Rajasthan Vide Reg. No. 1138/JAIPUR/ 2001-02 Dated 25-02-2002 and under consideration of N.C.T.E. Rekha Shiksha Prashikshan Mahavidyalaya, Jaipur offers various graduate courses as well as Post Graduate courses. Rekha Shiksha Prashikshan Mahavidyalaya, Jaipur is affiliated to University of Rajasthan, Jaipur. List of facilities available at Rekha Shiksha Prashikshan Mahavidyalaya, Jaipur for students.